Greetings and good wishes of abundance and peace at Easter and Passover. The studio will be OPEN Friday, Saturday and Monday, but CLOSED Sunday April 21. Welcome to Pathway Yoga, a friendly Iyengar yoga studio in the heart of Westboro, Ottawa. Iyengar yoga can lead toward balance and equanimity. Our experienced teachers will guide and challenge you to find out how. ​Find out more about our classes, workshops, fees, registration, schedule and check out the ​online Calendar. Iyengar yoga offers a wide range of practice for students of all levels and experience. Check out our new Spring Schedule! Registration is now open in our online Shop and at the studio. You are welcome to join classes any time - we will gladly pro-rate your fee, but paying for pro-rated feed is only available at the studio. The same applies if you know you'll be out of town and can only attend part of the session. Email us for more information. Invigorate! A 60-minute, fast-paced class! The perfect introduction to Pathway Yoga. Take four Invigorate, Gentle or Level 1 classes for just $50. This package is for new students, and you can register any time. If you decide to continue, we’ll pro-rate your fee for the rest of the session and give you 10% off the course fee too! Attend as many classes as life permits each week. Register now! No one should be prevented from attending yoga classes for financial reasons. If necessary, please contact the studio to arrange a fee you can manage. Each year, we practice together in the early morning light and air of spring. We refresh. We re-dedicate ourselves. 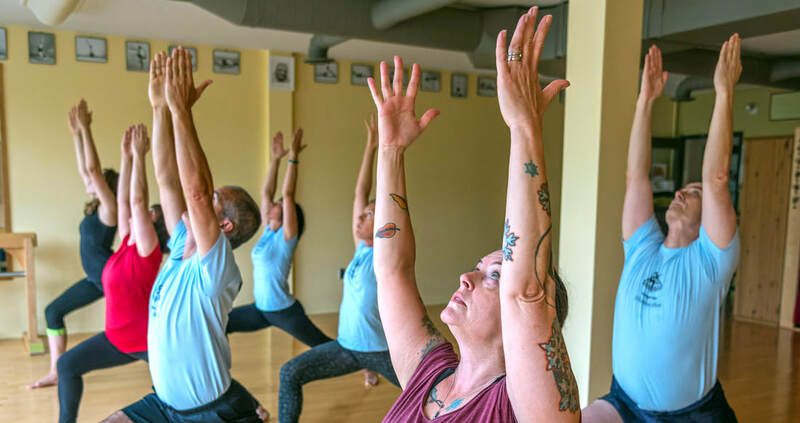 A period of sustained practice and reflection opens the door to a different experience of yoga and is a powerful step toward developing a home practice. This year, our 21-day sadhana will take place May 1 to 30, with classes running 6-7:30am on weekdays only, except Friday May 24. Participants should have at least 6 months of Iyengar yoga experience and be familiar with Sarvangasana or alternative. Fee is $250, or $200 for people already registered in classes. In April, Barbara will be attending the Mexican Iyengar Yoga Convention, with Abhijata Iyengar. Abhi studied daily for years with her grandfather, BKS Iyengar, as well as with Geeta and Prashant Iyengar. She radiates their command of the subject and their vibrancy of spirit. In this workshop, she will share a glimpse of Abhi's teaching. For experienced Iyengar yoga students steady in Sirsasana. Register now! Nadia will lead you through a sequence of postures and teach you ways of adapting your practice during menopause. She faced daunting challenges at this stage of her own life, and was helped directly by Geeta Iyengar. For Iyengar students with a minimum 6 months of experience. Register now! By offering a gift of yoga, you are offering a possibility of skillful transformation. Gift certificates are now available at the studio and online. If you'd like to receive the Pathway Yoga newsletter, just subscribe here and we'll add you to our list.